Relatives of self-taught mathematical genius George Boole have joined a delegation from Cork to celebrate the legacy of one of Lincoln’s most influential sons. Boole was born in Lincoln in 1815 and his work forms the basis of computer science and electronic circuitry. He is widely recognised as the forefather of the information age. In 1849 Boole was appointed as the first Professor of Mathematics at University College Cork, where he developed his most important work – An Investigation of the Laws of Thought. During their trip the delegation will visit Lincoln Cathedral, where there is a stained glass window marking Boole’s achievements. The delegation will also visit the mathematician’s former home and school in Pottergate. An exhibition commemorating his 200th birthday at the University of Lincoln’s Great Central Warehouse Library will be on display together with material from the archives. Mayor of Lincoln, Councillor Andrew Kerry, will welcome the Lord Mayor of Cork, representatives from University College Cork and Cork City Council, and relatives of George Boole. He said: “It’s so exciting to be part of the bicentenary celebrations of one of the world’s most renowned mathematicians. Professor Mary Stuart, Vice-Chancellor of the University of Lincoln, said: “George Boole is rightly recognised as the forefather of the digital age and is cherished both in Lincoln, the city of his birth and early career, and in Cork, the city where he pursued his academic life and his final resting place. Dr Michael Murphy, President of University College Cork said: “In Lincoln, Boole’s prodigious talent was nurtured and in Cork, at Queen’s College, he was given the opportunity, the time, the space and the environment to crystallise his thoughts that shaped our modern human experience. 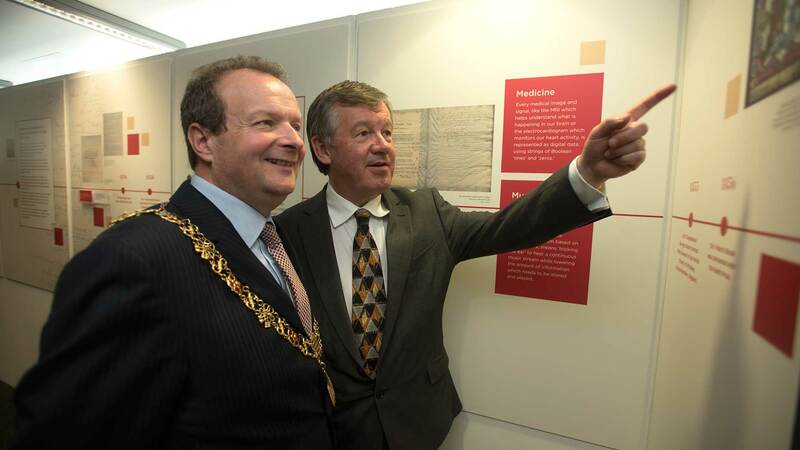 Councillor Chris O’Leary, Lord Mayor of Cork said: “I met last week with members of the Boole Family when they visited Cork and called in to City Hall. The Life and Legacy of George Boole exhibition is free to attend and will be open until Friday, September 11.